Is $20,000 K9 Storm Armor Enough to Protect Your Pup From Another Michael Vick Joke? I have admittedly mixed emotions about sending dogs into combat on our behalf, but as long as we're sending man's best friend into dangerous situations, we might as well give him badass armor. 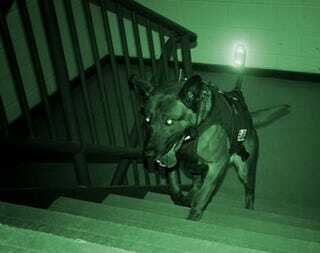 The K9 Storm Intruder, arriving in 2010, is a dog-fitted flak jacket, protecting a pooch's vital organs (other than the brain) while offering a means for handlers to track their animals. The vests are fitted with a wireless camera and speaker system, allowing you to see what the dog sees and maybe even command him appropriately, remotely.